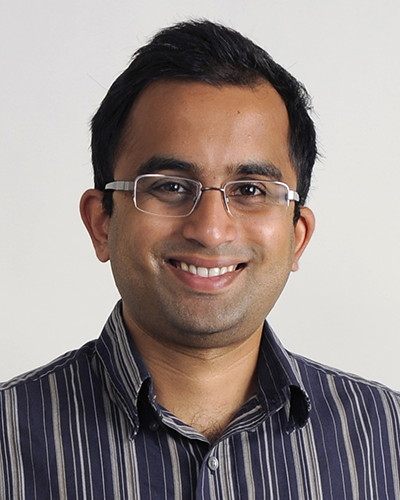 Aditya S. Khair, Associate Professor of Chemical Engineering at Carnegie Mellon University, is the recipient of the 2017 SOR Early Career Award. His research employs the tools of modern applied mathematics to quantify the dynamics of soft materials and complex fluids. A prominent feature of his research style is close collaboration with experimentalists. Khair received an MEng degree in Chemical Engineering from Imperial College London in 2001, a Master of Advanced Study degree in Mathematics from the University of Cambridge in 2002, and a PhD in Chemical Engineering from the California Institute of Technology in 2007. Khair’s doctoral work, under the supervision of John Brady, focused on the mechanics of colloidal dispersions; his doctoral research was recognized with the 2004 Economou Memorial Prize at Caltech. Khair pursued postdoctoral work at the University of California, Santa Barbara from 2007-10, working with Todd Squires, performing research centered on electrokinetic flows and phoretic colloid motion. Khair joined the faculty at Carnegie Mellon in 2010. Although still early in his career, Khair has already made numerous significant contributions to the field of rheology through both his doctoral work on the micro-mechanics of colloidal dispersions and more recently with his independent contributions in the area of large amplitude oscillatory shear flows. Khair brings fresh ideas from the field of electrokinetics to his rheology work, having conducted award-winning work on the effects of concentration polarization in high salt electrolyte solutions as part of his postdoctoral work. More recently, he has brought together his expertise in these two areas, examining the rheology of non-Newtonian fluids and contributing important insights into the nature of the coupling of electrokinetics and the microstructure of suspensions and emulsions. Khair’s deep knowledge of a diverse set of topics in transport phenomena of soft materials, combined with his rigorous research approach using scaling theory, asymptotic analysis, and numerical computations, has already led to surprising and useful insights into both (seemingly) established phenomena as well as new areas that are relatively poorly understood. Khair actively seeks out collaboration with experimentalists, endeavoring to connect his insights to real systems and thereby enhance the utility and impact of his work. Khair has published 47 archival journal papers over approximately the past decade in the general areas of microrheology, electrokinetics, and rheology. His papers are long, thorough, and complete, delving deeply into the theoretical underpinnings of a given phenomenon. That approach makes his publication numbers particularly impressive. Khair communicates complex ideas extremely well, and, combined with the depth of his work and impact of the results, this has resulted in a steady and high level of citations of the work by a broad community. He has won several honors and awards during this time, notably the Francois Frenkiel award for the most significant publication in Physics of Fluids by authors under the age of 40, the Camille Dreyfus Teacher-Scholar award, and a CAREER award from the National Science Foundation, in addition to the awards already mentioned. His unique capabilities set Khair apart from his peers and position him to make continued significant contributions as his career develops. Khair is one of the best theoretical rheologists in his peer group. Aditya Khair is an important asset to the rheology community, and as such we enthusiastically celebrate his designation as the 2017 recipient of the SOR’s Metzner Award. by Lynn Walker (Carnegie Mellon University), as appeared in Rheology Bulletin, Volume 86 Number 2, July 2017.